Biology of the Beluga Whale (Delphinapterus leucas). Click thumbnail image for larger photos. Belugas are small (for whales!) growing to lengths of 3 to 6. 5 m and weighing from 1000 to 1500 kg when full grown. The white colouration of the adults and lack of a dorsal fin is diagnostic for this species. Calves and juvenile Belugas are gray in colour, changing to adult white when they are about 6 years old. Belugas have a distinct "melon", a lump of oily tissue on their forehead. They have 30 - 40 peg-like teeth. 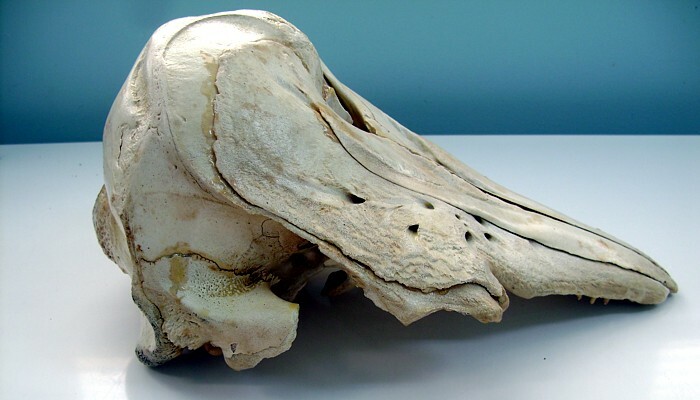 Their cervical vertebrae and not all fused so they can move their heads more than other cetaceans. 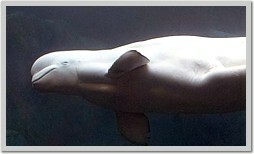 Together with an uneven tapering of the body this gives Belugas the appearance of having a separate head and shoulders. The genus name derives as follows: "Delphinapterus" is from the Greek "delphis" meaning dolphin and "apterus" meaning "without wing", a reference to the lack of a prominent dorsal fin. The species name "leucas" derives from the Greek "leucos" for white. Belugas are found in the arctic and subarctic oceans of Canada, Greenland, Norway, Russia and Alaska. There are isolated populations in the Gulf of St. Lawrence and the Sea of Okhotsk in eastern Russia. Throughout their range there are distinct populations that occupy separate regions of the northern oceans. Belugas are a marine species inhabiting coastal regions, but will occasionally enter brackish estuaries.They are found only in Arctic regions, not in the Antarctic. They frequent shallower coastal regions, but can dive several hundred metres deep in search of food. Winter ice formation governs the seasonal movements of Belugas. Summers are spent in shallow coastal waters. Large numbers will gather at estuaries for several weeks in mid-summer. As ice advances in winter the Belugas must move to ice-free regions, either beyond the reaches of the arctic ice sheet or in areas that traditionally stay ice-free owing to strong currents (polynyas). It is not unusual though for such sites to freeze over, trapping and ultimately drowning some Belugas. Some populations may travel as much as 2000 km from summer to winter ranges. Fish, shrimp, squid and other invertebrates, such as marine worms, make up the varied diet of this species. Belugas are "toothed whales", so they are not filter feeders like the much larger baleen whales (Humpbacks, Right Whales, Sei, Minke, etc.). They have flexible necks, unlike most other whales, and can swivel their heads to catch active prey, like fish. Food items are usually swallowed whole, the peg-like teeth are for grasping and holding on to prey, not chewing. 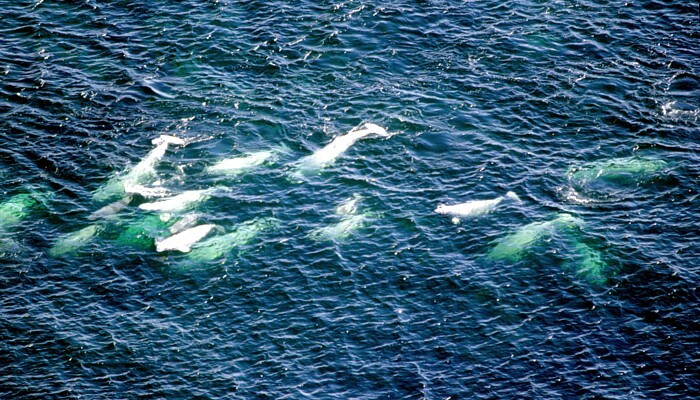 Population estimates for Belugas vary widely. Worldwide the population is estimated to be around 150,000 animals. 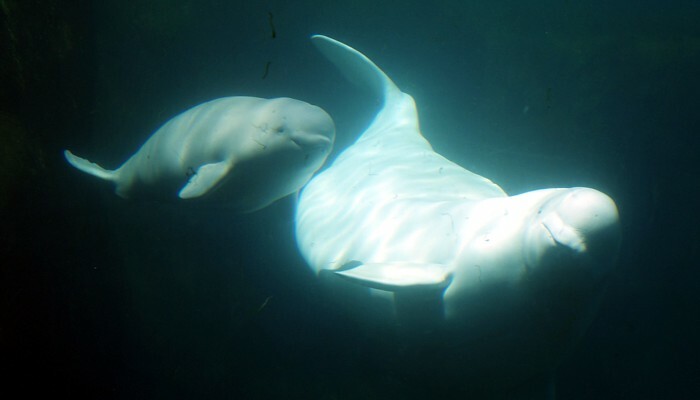 In Canadian waters there are thought to be from about 70,000 to 90,000 Belugas. The western Hudson Bay population is thought to be the largest in Canadian waters, at about 24,000. Mating occurs primarily between February and May and the young, known as calves, are born between March and September after a 12-14 month gestation. Calves, which are gray in colour, weigh about 80 kg at birth and remain with their mother for at least two years. It takes 4-7 years for a Beluga to reach maturity and they can live more than 50 years. 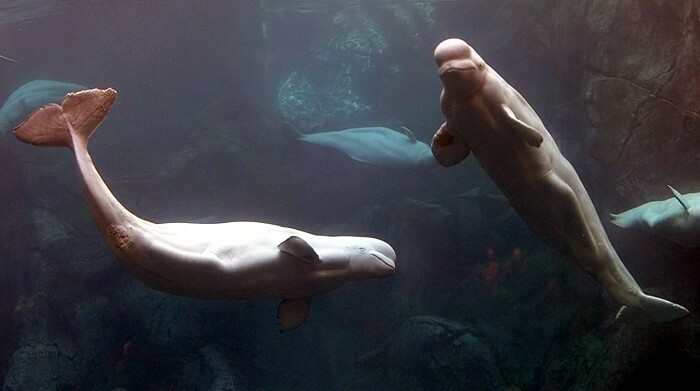 Belugas are highly social animals (they are quite playful in captivity) and are usually found in groups (pods) that may number in the hundreds. In summer huge numbers may accumulate in large estuaries where it's thought they go for several weeks to molt, socialize and rear their young. 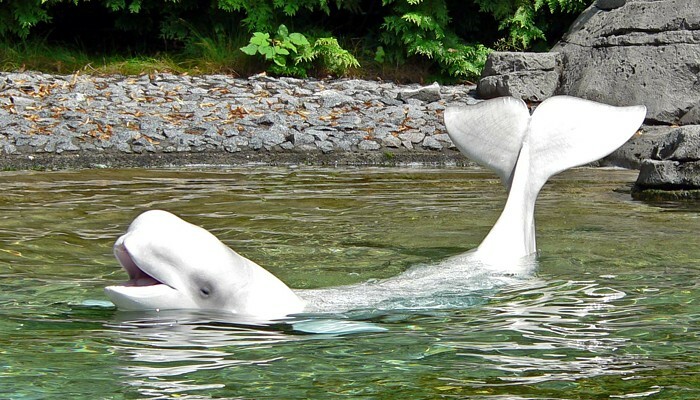 Sounds are very important to Belugas. Another name for Belugas is Sea Canary. They produce a wide array of sounds, from high pitched whistles to low grunts. 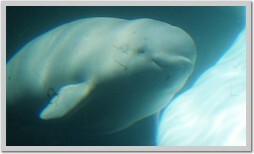 (See the links below for one site that lets you hear some Beluga sounds!) How these varying sounds are used in communication is not well understood. Belugas have a well developed sense of echo-location allowing them to locate prey and other Belugas in murky coastal waters. Their hearing is excellent allowing them to detect predators such as Polar Bears or Orcas. Belugas and other marine mammals have been staple foods for Inuit peoples for thousands of years. Though recent statistics are not available, in the 1990's between 400 and 700 Belugas were taken annually for food in Canada's arctic. Commercial hunting of Belugas is no longer legal in Canada, but there was once a thriving hunt for Belugas from the mid-1800's until 1970. The population of Belugas in the Gulf of St. Lawrence is considered to be Endangered with fewer than 1000 animals remaining. The Hudson Bay population is thought to exceed 25,000 animals and is considered healthy. Despite my rather strange first meeting with a Beluga, I've always found these to be intriguing animals. One day I'll make the trip to Churchill to see Belugas alive and cavorting in the ocean on Manitoba's northern sea coast. Thanks for learning about Beluga Whales! Bye for now!